In Angewandte Chemie International Edition, M. Kevin Brown and co-workers from Indiana University Bloomington reported a type of Suzuki coupling where 10% (Xantphos)CuCl catalyzed reactions between arylboronic esters and aryl iodides to provide biaryls. As in Suzuki coupling, a base was used, and in this case, the choice fell to sodium tert-butoxide. Optimally, the reaction proceeded in toluene at 80 ºC in 15 hours. Both electron-rich and electron-poor iodides and boronic esters were suitable for this process, but steric hindrance in one of the two starting materials needed Cy3PCuCl as the catalyst. The arylboronic esters can be synthesized from the corresponding arylboronic acids and neopentyl glycol as reported by Aiwen Lei and colleagues from Wuhan University, and (Xantphos)CuCl can be made from CuCl and Xantphos as described by the laboratory of Yasushi Tsuji from Kyoto University. (See the scheme below.) Sodium tert-butoxide can be purchased from chemical companies. Article: Zhou, Y.; You, W.; Smith, K. B.; Brown, M. K. Angew. Chem., Int. Ed. 2014, 53, 3475–3479. DOI: 10.1002/anie.201310275. M. Kevin Brown’s research group. 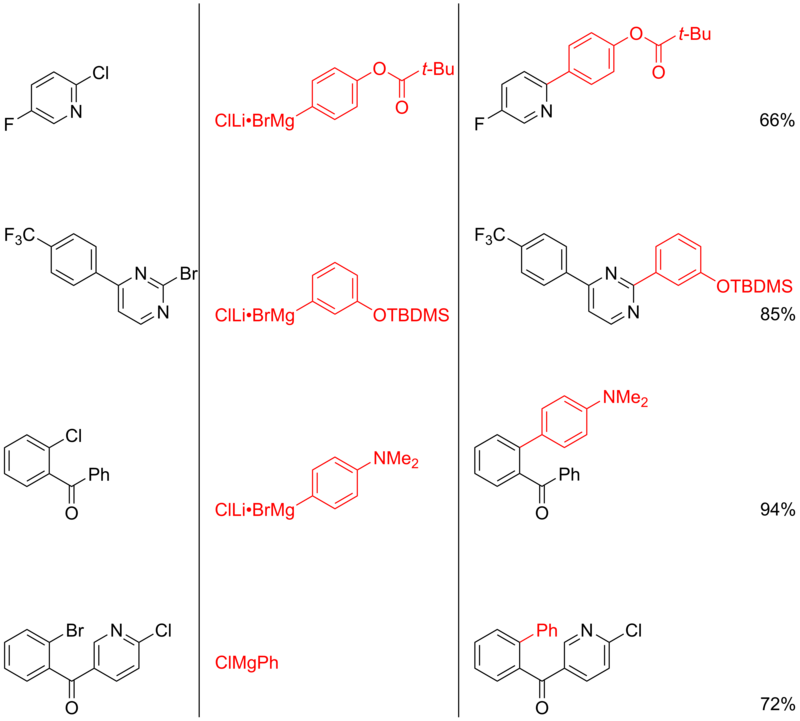 Syntheses of arylboronic esters: Liu, Q.; Li, G.; He, J.; Liu, J.; Li, P.; Lei, A. Angew. Chem., Int. Ed. 2010, 49, 3371–3374. DOI: 10.1002/anie.201000460. Synthesis of (Xantphos)CuCl: Semba, K.; Fujihara, T.; Xu, T.; Terao, J.; Tsuji, Y. Adv. Synth. Catal. 2012, 354, 1542–1550. DOI: 10.1002/adsc.201200200. There has been no activity in this blog for quite a while. I had family issues requiring me to stay in my fatherland for some time. I was also busy with the last phase of my study, but I have finally graduated. I am going to receive the beautiful pieces of paper in the coming months, but you can say that I am now a Master of Science. I am sure that you know the feeling to finally reach the finish line of one phase of your life! Fall has arrived, and I think I need to pack my summer clothes and put coats and thicker clothes in my linen cupboard. In my opinion, however, this blog can do with at least one new post. We have another article about biaryls. This one resembles the well-known Kumada coupling, except that chromium is used as the catalyst. Paul Knochel and co-workers at the LMU Munich, in collaboration with Novartis, reported in Journal of the American Chemical Society that 3% chromium(II) chloride catalyzed coupling reaction between (hetero)aryl halides and (hetero)arylmagnesium halides at 25 °C to produce bi(hetero)aryls. Tetrahydrofuran was the solvent under the optimized conditions. Most reactions were complete within 15 minutes to 2 hours although two examples with benzothiophene- and thiophene-containing Grignard reagents needed a higher temperature or a longer reaction time. A few examples below show the scope of this procedure. For years, Knochel and colleagues have developed handy ways to make (hetero)arylmagnesium halides. One example is starting with a (hetero)aryl bromide and exchanging the bromide with magnesium using complex i-PrMgCl·LiCl, made by stirring isopropyl chloride with magnesium turnings and lithium chloride in tetrahydrofuran at room temperature for 12 hours to obtain a yield of 95–98%. Another instance is stirring magnesium turnings and lithium chloride (with diisobutylaluminum hydride to activate the magnesium) in tetrahydrofuran for five minutes before adding a (hetero)aryl chloride or bromide; here, lithium chloride helps the insertion of magnesium into the carbon–halide bond. Chromium(II) chloride is commercially available. Article: Steib, A. K.; Kuzmina, O. M.; Fernandez, S.; Flubacher, D.; Knochel, P. J. Am. Chem. Soc. 2013, 135, 15346–15349. DOI: 10.1021/ja409076z. Preparation of Grignard reagents via bromide–magnesium exchange: Krasovskiy, A.; Knochel, P. Angew. Chem., Int. Ed. 2004, 43, 3333–3336. DOI: 10.1002/anie.200454084. Preparation of Grignard reagents via lithium chloride-assisted magnesium insertion: Piller, F. M.; Metzger, A.; Schade, M. A.; Haag, B. A.; Gavryushin, A.; Knochel, P. Chem.—Eur. J. 2009, 15, 7192–7202. DOI: 10.1002/chem.200900575.